When we meet our life partner it usually goes something like this: we spend the first few months happily dating, everything is new and exciting. We can’t believe our good fortune that this amazing person is in our life. We feel like we hit the jackpot! I know I did. I’d been single for so long, happy but lonely, and at the age of 34 wasn’t sure that married and happily ever after was part of my future. The punch-drunk love of early courtship eventually fades, and gives way to something much more substantial and lasting. You get engaged and have a blowout wedding, and then real life sets in. You buy a house, settle down and get a “real job. “ Maybe you lose said job, and find another. Being settled down can sometimes lead to feelings of restlessness and maybe boredom, even with the person whose presence you found so exhilarating at the beginning. You want more excitement in your life. And even though you’re married, “happily ever after” looks more and more elusive. My husband Mark and me on our wedding day, June 21, 2008. 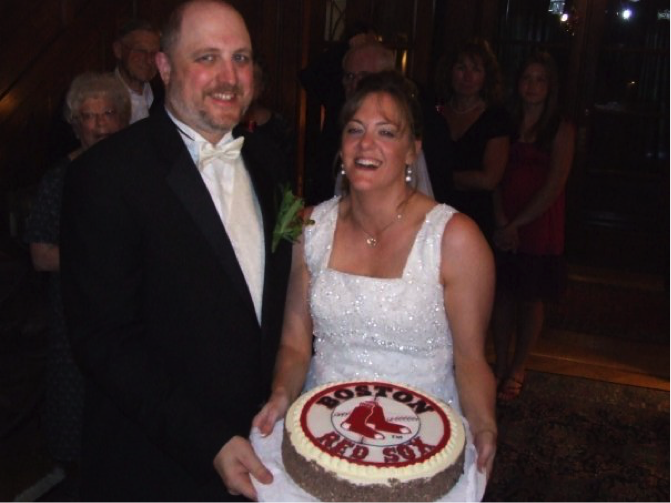 Ready to tackle the world, one Red Sox groom’s cake at a time. When you embark on a life journey with somebody, you have no way of knowing what curveballs life is going to throw at you. And unwillingly finding yourself on the path of fertility is certainly one curveball no one ever expects. No one thinks that they’re going to be the ones who struggle to grow a family. I didn’t. Even though I was over 40 when I started trying to have a baby, I was like every other woman and figured I’d be pregnant in a few months. Miscarriage #1, then ending up in the RE’s office and being told I had Diminished Ovarian Reserve and that I had less than a 2% chance of conceiving was a big wake-up call. Infertility isn’t just any old curveball; it’s the mother of all curveballs. It not only can blow the roof off your ideal of the perfect life, it shakes it at the very foundation. It gets you right at your core, your essence, your womanhood. I never thought I wanted kids when I was younger, but when the time came for me to want to have a child, I wanted it hard. And being told that it probably wouldn’t happen for me was more than devastating. The inadequacy I felt as a woman and as a person was palpable. When the doctor gave me my grim prognosis, I wanted to burst into tears right there in his office, but I held it together. I couldn’t wait to get home and crawl under the covers and cry my eyes out. I couldn’t even look at my husband. But something I’ll never forget happened. As I was looking away from Mark, I all of a sudden felt the warmth of his hand around mine. The simple act of taking my hand as I was being given devastating news spoke volumes. It reminded me that it wasn’t just my heartbreak, but ours. That even though I was the one with fertility challenges, it was something that affected both of us. That no matter what happened, we were in it together. As we proceeded with our IUI cycles, there were other challenging times. I had cycles cancelled, due to both cysts and hormones, and poor response to stimulation. Of course, the negative pregnancy tests were difficult to endure too. When Mark told me at one point during treatment that I was still the woman he fell in love with back in 2004, it made my world. You May Like Are Ovulation Predictor Kits Reliable? Here’s the deal: the fertility journey is one of those things that can either bring you closer together as a couple or drive you apart. There are so many people for whom it’s the latter. But you want to be one of the ones that it brings closer together. The best way to foster this is to keep the lines of communication open. Talk regularly about your experience, what you’re going through, and really listen to your partner when it’s his turn to talk. Since we women are the ones going through the brunt of treatment, taking shots, heading to the doctor every other day and being poked and prodded, it’s easy to feel like we’re more affected by the journey than our partners. But this isn’t the case. He needs to be able to freely share what he’s going through too. During our early marriage and trying-to-conceive period, Mark and I did a daily check-in where we shared not only the experiences of our day, but aired grievances (termed a “complaint with request for change”) and shared our hopes, wishes and dreams. When it was one person’s turn to share, the other person was required to listen without interrupting. It only took about 5 minutes a person to do this quick exercise each day. We called it the “Daily Temperature Reading” (DTR for short). It really helped to have that safe, non-judgmental space to share and get things off our chest. We’ve gotten away from doing this. We need to get back to it. Another thing that helps keep a couple bonded during the fertility journey is regular time to connect, away from fertility. This journey can consume your life so that it’s all you’re thinking about. Virtually everything you do is done in the name of increasing your chances at baby-making. It’s easy, and natural, to find yourself in that tunnel, but it’s just as important to remind yourself that you had a life, and a marriage, before you started trying to have a baby. You did things together, had fun together, and shared your lives. Making regular time to have “fertility-free” evenings where you go out and do those things together that you love can remind you why you fell in love in the first place. It solidifies the connection between you. Because when you get married, it is for better or worse. We all know it’s not going to be “better” all the time. It’s that connection that gets you through the “worse,” the harder times. How do you and your partner keep your relationship strong as you’re trying to conceive? You May Like BURPEES !! !